A griffin is a mythical flying creature that has the face of an eagle as well as the body of a large animal. In short, it was a vicious flying beast that is said to have lived around the medieval ages. This is exactly what this game is themed around. It is around the Great Griffin animal and the magic that surrounded it. This is why the symbols that appear on the 50 bet lines and the 5 reels of the game are inspired by that theme of the game. The symbols include the Griffin itself, magical potions, spell potions, candles, a feather and more symbols. They are all designed with a medieval touch to them in order for them to be fitting to the theme of the game. 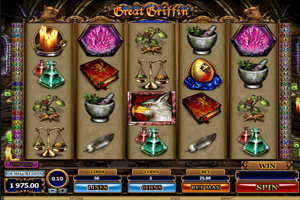 Play Great Griffin Slot here. The great griffin face is the wild symbol of the game. This means that the Griffin has the ability to replace any of the other symbols (with the exception of other special symbols) in order to form winning combos. Apart from that, it will also double any winnings that the Griffin helps in creating. During any of the spins during the normal game, a griffin can appear flying across the reels of the game in order to change any of the symbols into wild griffin symbols to help players get paid. There is also the Pick Me Bonus that is triggered with the lady in the hood and the free spins round that is activated by the logo of the game symbol.